School is about to start, but before you head to Copy Central and lay down $50 in readers stop by the ReUSE Reader Giveaway! Why: Save money, save paper, and get the readers you need! Or, spice up your life with a reader on a subject you’ll never take! German? Astronomy? Nuclear Engineering? History of Middle Earth? These can also make great gifts! And most importantly…. THEY’RE FREE!!!! Previous PostPrevious Free Days at Eshleman POSTPONED to next week! 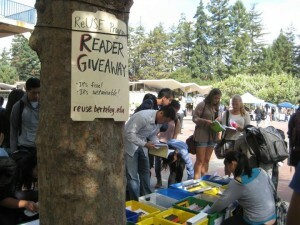 Next PostNext End of the semester: donate your readers at Moffitt Library, dorms, and I-House!